I don't know quite as much about Sleep Like A Log as I would like. They're one of those bands that existed at the edge of my knowledge of Japanese punk rock, but I had a harder time keeping tabs on them than some of the bands that would wind up on Snuffy Smiles or other labels I was more familiar with. I had their split 7" with Rumspringer and their third CD demo, but that was all until I went to Japan and was finally able to find more of their records. Sleep Like A EpiLog is a compilation of their non album tracks. It includes the aforementioned split 7" and demo along with the bands two additional CD demos. Ten songs in total and what a batch of songs it is. Fast and blistering guitars mix with melodic vocals and hooks everywhere you look. 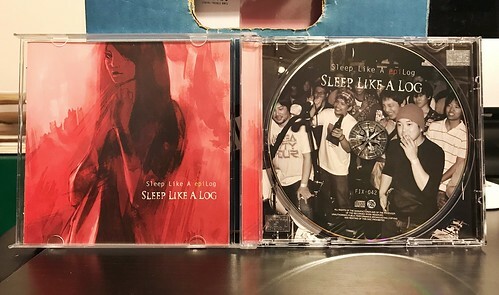 While they certainly fit in quite well with their compatriots on Snuffy Smile, Sleep Like A Log, to me, is a bit closer to UK style melodic punk with a sound that reminds me of Hooton 3 Car, but with a bit more of an edge. No matter how you want to mix your "sounds like" adjectives, one thing that's undeniable is that this is a great record. Every time I hear an album like this I'm exhilarated and a little bummed out at the same time. Exhilarated because it's another amazing record to listen to. Bummed out because there are so many bands in Japan playing the exact kind of music I want to listen to. It feels like the scene I enjoy the most is just going on without me a little too far away. At least I have the records.